Some athletes train for years to win a major sporting event, and others are yanked away from breakfast at the last minute and ordered to compete in a high-profile auto race against some of the top national drivers. Such was Ben Noonan's morning on May 9, 1909. The race was the California Grand Prize Race: Santa Rosa to Geyserville and back again, 52 miles in all, for a big trophy and a $500 prize. Similar cross-country races would soon be held regularly around the Bay Area - an Oakland to San Francisco via San Jose race followed a week later - but this was the first, so it was a very big deal. Thousands came from San Francisco and other places. "Santa Rosa saw more automobiles on Saturday and Sunday than ever had been in this city before," the Republican newspaper reported. "Special service on the bay brought many machines and every boat on Saturday carried four cars, the number allowed at one time." Every garage in the city was crammed with cars Saturday night, and vacant buildings that could accomodate an auto were also used. By 7:30AM on that Sunday morning, "fields and cross roads were badly congested with people and vehicles of every description, everyone anxious to catch a glimpse of the speedy cars." Santa Rosa National Guard Company E had uniformed men along the entire route to keep the road clear of spectators. Ben Noonan was a local young man; his family owned the slaughterhouse at today's corner of W. College and Dutton Ave. (no mention of Noonan Meat Co. can pass without noting that the company had an entitlement from Santa Rosa to herd cattle down College Avenue from the Southern Pacific stockyard on North Street). Ben had not competed in an auto race before, but he was well known in town for his remarkable speeds on a bicycle. He had won several local competitions, and once beat the electric train from Santa Rosa to Sebastopol - even more remarkable when you consider that he did it on a dirt road using a bike with a heavy iron frame. The car he drove in the race was one of two Stoddard-Daytons entered by the J. W. Leavitt auto dealership of San Francisco. The other was to be driven by Fred J. Wiseman, Ben's old friend and former business partner. They had been "Wheelmen" together in Santa Rosa's bicycling club, then opened the Santa Rosa Cyclery, where they also rented small cars out by the day or week. Wiseman - who would make history a couple of years later for making the world's first air mail flight - was then a professional driver for the Leavitt dealership, competing on race tracks around the West in a Stoddard-Dayton and showing off the powerful car. Noonan was also apparently then working as a driver for Leavitt, as the story in the Press Democrat remarked he was having breakfast at a downtown hotel when he was told he had to be at the starting line in twenty minutes; M. Peters was supposed to drive, but injured his arm. (This is certain to be J. W. Peters, who was often Wiseman's passenger-mechanic on cross-country races, and later helped Wiseman build his first airplane.) Ben demurred until he was told that Wiseman would be disqualified unless both Stoddard-Daytons were in the race (it was never explained why). "At this urging and condition Noonan jumped from his seat, leaving his breakfast untouched, ran to the garage donned overalls and jumper over his good clothes, climbed into the machine and was off," the PD said. The starting point was on Mendocino Avenue at the edge of city limits, which in 1909 was the current location of the new SRJC parking garage. The 12 racing cars were lined up in a string, and left at one minute intervals. All cars had a passenger-mechanic, and the injured Peters rode with Noonan. Crowds cheered for them all and it was said that the entire population of Healdsburg turned out to watch the cars round the square. Some of the local cognoscenti camped out at spots they knew would be hard-going. Motor Age magazine reported, "One of the most interesting points along the road was at the Healdsburg bridge, at the end of which the cars had to make a turn at right angles. This meant a complete shutdown and the shots of the motor due to the surplus gas suggested an artillery duel." It was immediately clear that this would be an endurance race. One car didn't make it out of the starting line, another only made it as far as Healdsburg before its frame cracked, and another hit a rock so large that it bent the tire rim. Several had flat tires. Fred Wiseman had to stop on Dry Creek Road to tie up a broken rod with hemp rope, which wouldn't hold and caused him to stop three more times. The most astonishing tale, however, belongs to "plucky driver" Fay Sheets, who lost the tire off his left front wheel around Windsor on the way back - yet still finished the race. Only half of the cars made it back to Santa Rosa. Ben Noonan won the day, with a time of about 1:05. Wiseman came in third about five minutes later, his rod still hemp tied. Noonan won by virtue of having no mechanical failures, avoiding pointy rocks, and being very familiar with the road, having ridden it many times on his bicycle. "I know that route like a book," Noonan told the Republican afterwards. "Every corner and every bad place on the road is marked in my mind's eye, and when I came to one of the spots, I slowed up and let the car make it up on the straightaway, where the surface was good. I didn't have a particle of trouble, and I attribute the victory to the reliability of the car and that easy going at the corners." It was a great day, and as the Press Democrat explained, "Noonan must have been a happy lad. He was cheered repeatedly when he drove by the Santa Rosa contingents all along the line, and more so when it was learned that he had won the race. 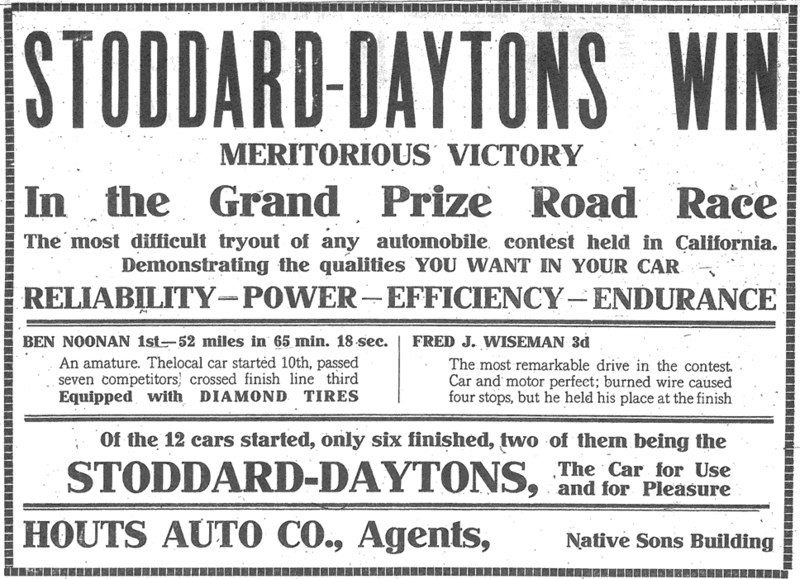 At the garage of the Houts Auto Company, the local agents for the Stoddard-Dayton, the winning machine was photographed probably a couple of hundred times. For a time both machine and driver were under the camera." Much photographed and much cheered on that morning in early May, the end of the month found Ben Noonan being held in the Ukiah jail for a day and fined $25 for speeding in city limits. Sic transit gloria mundi. BEN NOONAN, the Santa Rosa boy, drove a Stoddard-Dayton to victory and a splendid finish in the grand prize automobile road race at Santa Rosa on Sunday. Maintaining a thrilling rate of speed throughout the fifty-two miles of the course he accomplished the great feat without accident or a hitch. New in the racing game as far as driving automobiles is concerned he ran away with the older and professional experts, gaining well earned laurels for himself and for the City of Roses. It was the first road race ever held in this state and consequently automobile owners and dealers all over the state of California were interested in the event pulled off in Santa Rosa. In the opinion of many, grand automobile prize road races may come and go but none better will ever take place. In no race will a better bunch of cars and drivers be entered as competitors. And it was particularly pleasing that the race passed off without accident, except to machine. Thousands of people, occupying all the points of vantage along the fifty-two miles of racing, watched with excitement and as the racers flew by pent-up enthusiasm broke out into cheers that echoed through valley and across the hills. They came from all over northern California to be present and witness the first road race in the state. Scores of automobile loads of people passed through this city early in the morning bound for different points where a broad expanse of country allowed an uninterrupted view of the race for a mile or two. The biggest crowds naturally gathered at the dangerous turns of the road, and while they breathlessly witnessed what seemed hairbreath escapes from disaster, yet every car made the turns without accident. Noonan's fine car, his skill and nerve and knowledge of the road were his triumph in that most strenuous of tests on Sunday morning. He had unbounded faith in his car and that counted for much. It was known to comparatively only a few Santa Rosans that Noonan was to take the wheel in his Stoddard-Dayton in the race. But those who were in possession of the information were willing to stake their pile that if nerve and skill without an accident to car was in the balance that Noonan would come mightly near taking the race. 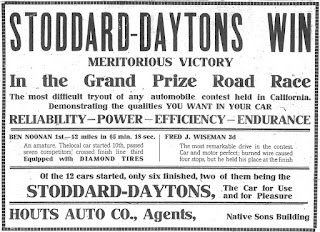 The Stoddard-Dayton won by a very narrow margin, however, as the Stevens-Duryea, driven by Ontank, crossed the tape just two minutes and twelve seconds behind it, winning the handsome cup offered by the Moore Motor Supply Company for the winner of the second place. On the return trip coming through Healdsburg one side of the frame cracked almost in two pieces. Onthank kept going and made a splendid run. For sixteen miles that plucky driver, Fay Sheets, drove the Acme with the tire off the left front wheel. When the car passed the hundreds of spectators during that long run, minus a tire, they fairly gasped. It was nothing short of miraculous how the driver kept the car on the road at all. The cars were started one minute apart at nine o'clock from the city limits on the Healdsburg road. Wiseman's car was the first to leave the starting line, having drawn the first position. He led the Acme, which was off second, all the way to Geyserville, and was first to reach the Dry Creek road. Here the Stoddard slowed up somewhat and half way around the loop the Acme went to the front. Wiseman had to get out of his car to fix a broken rod, but when he got going again he was still ahead of his other rivals, and he went on to profit by the Acme's misfortune in losing the tire already mentioned and reached the finish in the position he started. After the sensation caused by the arrival of the first four cars had subsided, the spectators had an intermission of a few minutes before the cloud of dust at the end of the finishing straightaway heralded the approach of the Buick, driven by Frank Murphy, which figured into fifth place, was followed by the Tourist, driven by Ely, which proved to be the last of the cars to cover the course. Ely made a great run, but a tube broke in the ignition system and dropped into the flywheel of the machine. Before the driver could get under way again he had lost thirteen minutes, but the Tourist man was determined to fight it out to the end and he went on and secured sixth place. Tire troubles were the cause of the dropping out of most of the cars which did not complete the journey. Louis Burnham's Thomas did not get as far as Healdsburg on the outward journey. His car was fitted with detachable rims and the rim and tire came off one of the wheels before the car had gone ten miles. The Packard car centered by A. J. Welch was close behind the winning Stoddard at Healdsburg on the return trip when a stay nail went through the tire and the car had to be pulled up. The Speedwell was another sufferer from punctures. After making the fifteen-mile run to Healdsburg in eighteen minutes, the car had to stop on account of a flat tire. The Comet had two tires out of commission at one time, one of the tires cut as by a knife, evidently the result of running over a sharp rock. Two Stearns cars were entered and were favorably regarded by most of the experts before the race, especially as Soules and Bonney, two skillful drivers, were handling the wheels, but neither completed the journey. The Pope-Hartford was ready to start, but its fibre timing gear stripped and the car did not get across the line. Santa Rosa naturally feels proud of itself that its boy won the great race, and that Fred J. Wiseman, another Santa Rosa boy, who drove a Stoddard-Dayton too, figured so prominently in the race and won third place. Noonan must have been a happy lad. He was cheered repeatedly when he drove by the Santa Rosa contingents all along the line, and more so when it was learned that he had won the race. At the garage of the Houts Auto Company, the local agents for the Stoddard-Dayton, the winning machine was photographed probably a couple of hundred times. For a time both machine and driver were under the camera. The machine was garlanded with flags. The auto was given a critical inspection by experts and was thoroughly gone over. It was found to have stood the strenuous drive in fine shape. Both the Stoddards in the race were entered by the Leavitt Company. As the horsemen would say, 'twas a great day and a great race. Up to within twenty minutes before he took his seat in his car to drive from the Houts Auto Company's garage in the starting place for the big road race on Sunday morning, Ben Noonan did not know for sure that he would drive in the race. In fact he had made up his mind that he would not. He was eating his breakfast, dressed in his Sunday best, at a table in the Hotel Lebanon. Someone rushed in and told him that he must come at once and drive the car. "Oh, I am not going to drive. Let someone else do it," he said. "You must come, you and nobody else," he was told. "If you don't drive the other Stoddard will be pulled out of the contest." At this urging and condition Noonan jumped from his seat, leaving his breakfast untouched, ran to the garage donned overalls and jumper over his good clothes, climbed into the machine and was off.